Andrea Reid is a National Geographic Explorer, fish biologist, diver and conservationist from Prince Edward Island, Canada. Reid’s research integrates practice and theory from the fields of ecology, physiology, and sociology to address some of today’s most pressing aquatic conservation problems. Her work focuses on stressed-out fish and fisheries across the globe: East Africa, Southeast Asia, Oceania, and the Pacific Northwest. Reid mixes quantitative and qualitative methods from the natural and social sciences to holistically approach the complexities of fish conservation and fisheries management. Reid holds a B.Sc. in Environmental Science and M.Sc. in Biology, both from McGill University. For her Ph.D. in Biology at Carleton University and the University of British Columbia, Reid has received an ‘Alexander Graham Bell Canada Graduate Scholarship’ and an ‘Aboriginal Ambassador Award’, both from the Natural Sciences and Engineering Research Council of Canada (NSERC). These support her research and outreach on the topic of Pacific salmon bycatch in the Pacific Northwest. Her career is dedicated to the study and conservation of wild fish and the management of healthy fisheries – she engages Indigenous community members as active participants in the research process and is herself a member of the northern, coastal Nisga’a Nation. For an example of Reid’s research, click here. For more information on Andrea J. Reid, click here. Reid, A.J., A.K. Carlson, I.F. Creed, E.J. Eliason, P.A. Gell, P.T.J. Johnson, K.A. Kidd, T.J. MacCormack, J.D. Olden, S.J. Ormerod, J.P. Smol, W.W. Taylor, K. Tockner, J.C. Vermaire, D. Dudgeon and S.J. Cooke. 2018. Emerging threats and persistent conservation challenges for freshwater biodiversity. 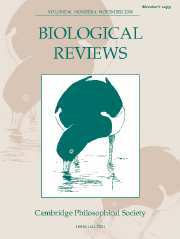 Biological Reviews. DOI 10.1111/brv.12480. Cook, K.V., Reid A.J., Patterson, D.A., Robinson, K.A., Chapman, J.M., Hinch, S.G., Cooke, S.J. 2019. A synthesis to understand responses to capture stressors among fish discarded from commercial fisheries and options for mitigating their severity. 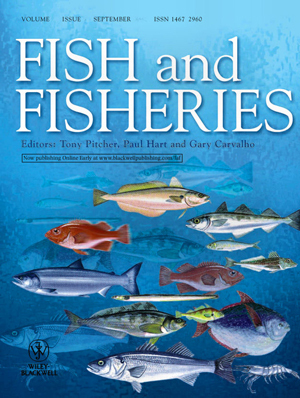 Fish and Fisheries. 20:25-43. Cook, K. V., Hinch, S. G., Watson, M. S., Patterson, D. A., Reid, A. J., & Cooke, S. J. 2018. Experimental capture and handling of chum salmon reveal thresholds in injury, impairment, and physiology: Best practices to improve bycatch survival in a purse seine fishery. 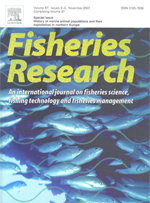 Fisheries Research. 206: 96-108. Lynch, A.J., I.G. Cowx, E. Fluet-Chouinard, S.M. Glaser, S.C. Phang, T.D. Beard, Jr., S.D. Bower, J.L. Brooks, D.B. Bunnell, J.E. Claussen, S.J. Cooke, Y.-C. Kao, K. Lorenzen, B.J.E. Myers, A.J. Reid, J.J. Taylor and S. Youn. 2017. Inland fisheries – invisible but integral to the UN Sustainable Development Agenda for ending poverty by 2030. Global Environmental Change. 47: 167-173. Reid, A.J., M.J. Farrell, M.N. Luke, L.J. Chapman. 2013. Implications of hypoxia tolerance for wetland refugia use in Lake Nabugabo, Uganda. Ecology of Freshwater Fish. 22:421-429. Reid, A.J., L.J. Chapman, A. Ricciardi, A., 2013. Wetland edges as peak refugia from an introduced piscivore. Aquatic Conservation: Marine and Freshwater Ecosystems. 23:646-655. Johnson, C.A., D. Raubenheimer, C.A. Chapman, K.J. Tombak, A.J. Reid, J.M. Rothman. 2015. Macronutrient balancing affects patch departure by guerezas (Colobus guereza). American Journal of Primatology, 79:1-9. Reid, A.J. 2012. Predicting peak refugia for mitigating impacts of invasive predatory fishes. Department of Biology. McGill University, Montreal, Canada (M.Sc.). *Tombak, K.J., *A.J. Reid, C.A. Chapman, J.M. Rothman, C.A. Johnson, R. Reyna-Hurtado. 2012. Patch depletion behavior differs between sympatric folivorous primates. Primates. 53:57-64. *Equal contributors.